I love the impressionists. The bright colors as in Gaugin’s Vision After the Sermon (1888). 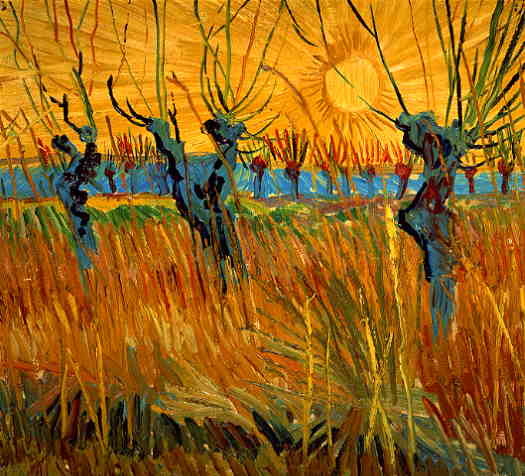 Or take a look at Van Gough’s Pollard Willows With Setting Sun . The yellows and the reds are just phenomenal. So I decided to try painting with an impressionistic palette. One of the things we learn when studying art is that “Then” and “Now” are very different. From the grounds that are used to prepare the canvas to the paints themselves. For instance Max Dorner writes of old Italian grounds using ground marble instead of the gesso widely used today. We also, cannot “now” pick up the standard American oil paintbox kit and expect to use the colors provided to paint like an impressionist. Granted, the talent the great impressionists had (have?-is a school bounded by time?) is rare and the average beginning student of art such as myself cannot hope to create at their level. Monet used quite a limited palette, banishing browns and earth colors and, by 1886, black had also disappeared. Asked in 1905 what colors he used, Monet said: “The point is to know how to use the colors, the choice of which is, when all’s said and done, a matter of habit. Anyway, I use flake white, cadmium yellow, vermilion, deep madder, cobalt blue, emerald green, and that’s all.” ” She has written an excellent online article Palettes and Techniques of the Impressionistic Masters: Claude Monet. Today, most of us don’t have tubes of lead white for obvious safety reasons and use the more modern equivalent of many other colors as well. The other thing impressionists did was ban black and grey from their palettes. So here are two paintings of mine in which I try to use a palette similar to the impressionists. Once again I am trying to use the “techniques of” rather than painting in the style or form of one or another of them. First I am not them and secondly, obviously I do not have their experience or talent. First as usual, my reference photo. This is a train station in Munich with an arriving train on a rainy day. And here is my interpretation of that photo. I like how it came out and tried to use softer edges in the distance to work on my perspective skills as well. I also used a yellow ground or under-painting. But when I was done I still had a pile of wonderful vibrant colors on my palette and wasn’t in the mood to stop painting. So I painted a “still life” of my workstation. And then I was all out of paint. And that was a good thing. This entry was posted in Original Art Biography, Techniques and tagged Art then and now, impressionistic palette by boss. Bookmark the permalink.